No, my point is that a map is a complex thing with many cooks working on it. For Ogledow for instance several custom statics were made by roughbeak and nissi. The 120mm mortar was made by Fred (I think?) and coded in by Stubbfan. Harmonikater fixed that bizarre KT bug, the testers gave feedback and ideas etc. Probably forgetting people, but my point is that this is the case for every map. And since all these people work for free and on different schedules, actually finishing a patch with several different maps is extremely complex and hard to predict. Well map is complex thing definitely,but its still nice to have all that people around to help you. It push you forward when you get all that stuff, feedback,ideas. Will you take a break from mapping, started new map, or help around in team? Will you take a break from mapping, started new map, or help around in team? The map looks amazing, like someone said I love how nice and bright it is. It reminds me of some of the Red Orchestra maps. The little touches are great, especially the greenhouses and the flowers. I also love that table with one chair turned up on it, it looks very real. I'm just jealous I won't have a PC to play this for a few months! TS did a good job of making the statics very realistic. The map is very open with large fields for tanking. But in the infantry areas there's a lot of nice detail added to the building interiors and farm/ garden areas. That's the most fun part of mapping imo, adding those details. Yeah, he makes the best maps. The lighting looks amazing! Your next video should be of you cooking a 5 course meal. Participation in the Civil War or subsequent combat in defense of the USSR or the patriotic war: South Front from 1942 to February 1943, 1st Ukrainian Front since June 1944. Commissioned at: Korovinsk recruiting office, Ryazan oblast. Brief and specific description of heroism: As a T-34 tank commander in a tank group, Guards Junior Lieutenant Oskin showed himself a quick and fearless officer. On August 12th, 1944, when deflecting an attack by superior forces composed of 15 Tiger B tanks (King Tiger), Oskin decided that he would rather die than let the enemy through to Staszow. Comrade Oskin entered into an uneven battle with German tanks. Calmly and surely, he opened fire and ignited three enemy tanks. 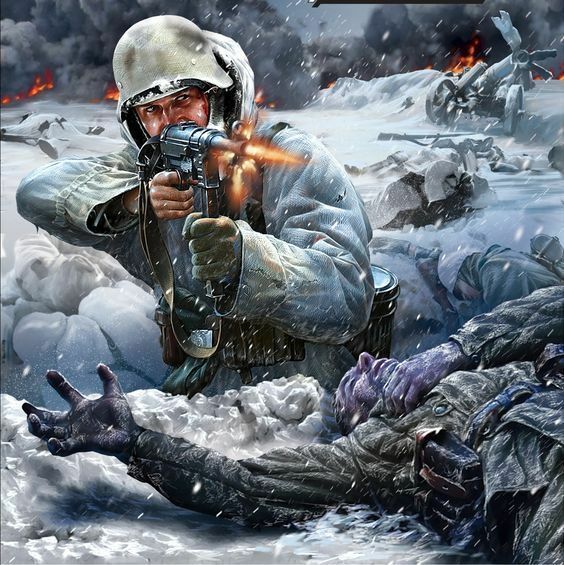 The others routed under comrade Oskin's deadly fire and fell back. Comrade Oskin's machineguns also cut down submachinegunners riding on the tanks. The enemy did not reach Staszow. On that same day, fulfilling his orders to knock the enemy out of Ogledow, comrade Oskin's tank burst into the village. With its tracks, it crushed up to 80 fascists, continuing to fire from its gun and machineguns to destroy fleeing Germans and their vehicles. In the battle for Ogledow, three Tiger B vehicles were captured completely undamaged. For destroying 3 Tiger B tanks, a rushing maneuver to capture Ogledow leading to the capture of three intact Tiger B tanks, and bravery and heroism shown in battle while holding the foothold on the Western shore of the Vistula river, comrade Oskin is worth of the title of Hero of the Soviet Union." I don't doubt that this person deserved whatever medals he was awarded. But running over 80 people that must be an exaggerated number. 80 people? That has to be an exaggeration, although the war on the Eastern Front was somewhat of a meatgrinder. My guess is that they ascribed the deeds of his unit to one guy, the germans also tended to do that. I think 80 people crushed in the tracks would have halted the tank.